Ten pillars of pale blue crystal jut straight up from the island that has become the City of Blue in the unimaginatively named Azure Sea (which is actually a massive freshwater lake). The pillars are are almost perfectly square, set perfectly vertically to the horizon, and are roughly 400 feet wide (although scholars of the city will be quick to point out that they are precisely 396 feet, 2 inches, accounting for some sections having worn corners and edges). These pillars are of a robins-egg blue stone not found anywhere else in the world and they tower over the lower parts of the island by about 200 feet. The pillars are the kind of thing that get peoples’ attention. Many have traveled to the island to investigate these strange (and ever so slightly magical) stone formations. They appear to run straight down to immeasurable depth, and no amount of mining at the base of any of the pillars has determined a bottom. 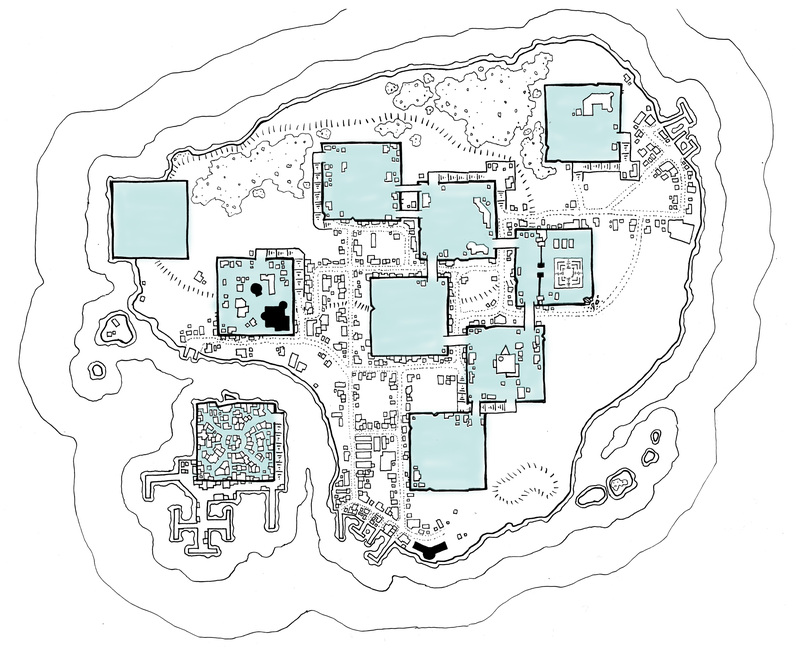 Several magical schools and groups of sages have set up operations on the island over the decades, and the City of Blue has become a fairly self-reliant trade hub of its own right in recent years. Much of the city infrastructure (and the highest building density) is on the one pillar that is off the island proper. 300 years ago, when the waters in this area were contested between empires, an army of freebooters and mercenaries descended here and took over the island and burned most of the structures, leaving only the small port attached to the lone pillar standing. 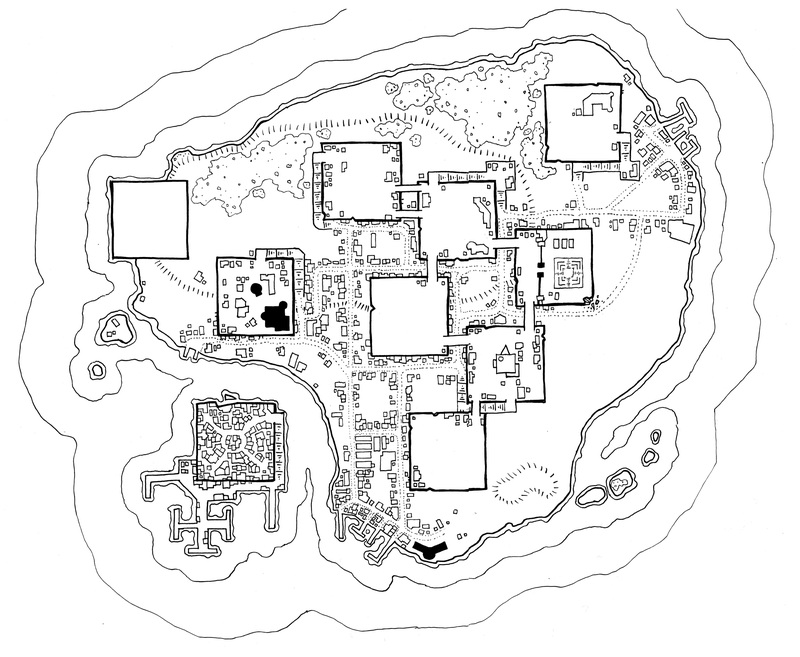 With the end of the border dispute between the empires, the freebooters were finally removed from the island nine years later and the city has slowly been rebuilt. One pillar in the middle of town has almost no structures on it to this day (as well as “the Orphan”, the pillar furthest to the west which has never had stairs attached to it). This pillar is known as “the Ghost” and during the reign of the mercenaries, those who resisted their orders were left to hang from the edge of the pillar in chains. There are many stories of the images of these dead gentlemen still haunting the blue crystal of this pillar, and few are willing to build here. While living upon the pillars themselves requires a significant effort in transporting (or magically producing) water, many have claimed that those who do live and study directly on the blue stones age more slowly and enjoy better health than those living in the mud below. As such, the six “bridged pillars” all have a number of structures on them (even the haunted Ghost Pillar) – including a walled off stepped pyramid that houses a religious and secretive research team. In addition there is a full fortress constructed on the seventh central pillar (known as… The Seventh – the residents of the City of Blue tend to be sages and researchers and are notoriously lacking in the capacity for imaginative names) which acts as the centre of government now that the port pillar is so overcrowded with shops and businesses. At the northeast end of the island is a small fishing village surrounding the Fishers’ Pillar with their own docks and piers. Most travelers however arrive via the Port Pillar in the small bay, and then those seeking more information about the pillars themselves (or more affordable accommodations) will grab a small taxi boat from the Port Pillar to the southeast island port. This is wonderful, I’m going to go ahead and be the third to call for elevation. This is likely going into my campaign as well! All these calls for an elevation map… the island already has elevation markers on it without specific heights… so just add height markers like this? No, a “side view” elevation. B58. A side elevation would be better. Are all ten level with each other at the top? A very lovely map, though it almost demands a little elevation illustration. Strange places are far more interesting to me then more tombs and abandoned dwarf fortresses, will absolutely be added this location to my current game world. I love bizarre and intriguing places like this! Well done. And the map is quite amazing too. LOL. I think we all meant the isometric view, a 3D rendering of the map, which gives us a better idea of the elevations of all the blue towers. I find this an inspiring map! Cool writeup on the history of the town and the pillars. A nice basis for adding more on pillar lifestyle, tactical use, scholarly mysteries etc. Will definitely use this. Thanks! Also, any map with lots of tiny detail rock!